Lawmakers in the House are expected to overwhelmingly pass new legislation on Wednesday that would prohibit the Obama administration from facilitating the sale of U.S. aircraft to Iran, according to senior congressional sources who told the Washington Free Beacon that Iran is likely to use American-made planes to rebuild its aging air force. The legislation is viewed as an early test for the incoming Trump administration, which has broadly opposed last year's comprehensive nuclear agreement with Iran and intimated that it would be more confrontational with the Islamic Republic. Senior congressional sources told the Free Beacon that House leaders scheduled the vote on this bill immediately following the election to signal that lawmakers are frustrated with the Obama administration's ongoing diplomacy with Tehran. If approved, the new bill would bar the Obama administration from granting legal exemptions to corporations such as Boeing, which is working to finalize a multi-billion dollar landmark deal with Iran. The Obama administration has already vowed to veto the legislation. "The American people gave us a mandate to fight radical Islamic terrorism. Preventing aircraft sales to the world's leading terror state is a pretty good start," said one senior GOP aide familiar with the legislation. "Clearly this is a top priority for House Republicans—we are making this the first bill we put on the floor after the election. The Boeing-Iran sale is a great opportunity for President-elect Trump to claim an early national security win." Rep. Peter Roskam (R., Ill.), a vocal critic of the nuclear deal and Iran's continued military buildup, told the Free Beacon that Republican House lawmakers will easily pass the legislation. "It's no secret I've been a vocal critic of the Iran deal—it was a horrible idea at the time and it has proven even worse as we've learned about secret side deals and more unilateral concessions to the Mullahs," Roskam said. "But even those who supported the [nuclear deal] should support this bill. Nothing in the Iran deal obligates the U.S. to allow American banks to finance the Islamic Republic's efforts to rebuilt its air fleet." The Obama administration said in a statement late Monday that the legislation would interfere with the United States' ability to uphold its end of the nuclear deal, which includes guarantees that Iran would be able to access the U.S. marketplace for commercial aircraft. "The bill would undermine the ability of the United States to meet our JCPOA [Joint Comprehensive Plan of Action] commitments by effectively prohibiting the United States from licensing the sale of commercial passenger aircraft to Iran for exclusively civil end uses, as we committed to do in the JCPOA, and seeking to deter companies from pursuing permissible business with Iran," the White House said in a statement. Critics of the administration's position have pointed to evidence that Iran has a history of converting civilian planes for use in its air force and military. The Free Beacon in October disclosed several instances in which U.S.-made airplanes purchased by Iran in the 1970s had been used by Iran's military. Roskam told the Free Beacon at the time that there was reason to expect Iran would make similar use of any new planes it purchased from Boeing, which did not respond to a request for comment on the new legislation. 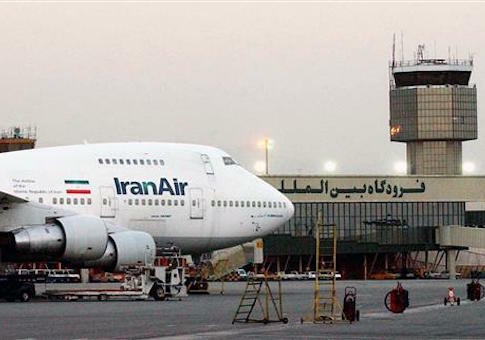 "We should not be surprised to see Iran's latest military demonstrations feature Boeing 747s," Roskam said. "It is incredibly irresponsible for any American company to sell products to the Islamic Republic that can easily be used for military purposes." "This is not hypothetical," Roskam said. "We know the military has requisitioned Boeing planes from Iran Air in the past. Boeing is literally enhancing the military capabilities of the world's leading state sponsor of terrorism."